I have been spending a lot of time training CRM end-users lately, and keeping up with the MS CRM public newsgroup. This has got me thinking about the basics of using Microsoft CRM 1.2. 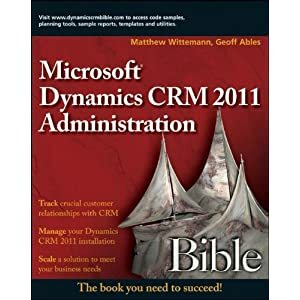 There are really only two books out there on Microsoft CRM -- CRM for Dummies and John Gravely's CRM Special Edition. The hard part of creating a good book for end-users is that no two MS CRM deployments are quite the same. Often they are heavily customized. This means that there is a lot of custom training required for employees that use CRM in their daily work. (Someday when I have more time on my hands I'll blog about how training seems to often be an afterthought for most companies. It's an up-hill battle convincing clients that as much time and effort should be expended on training as on designing a CRM system.) Anyway, I thought I might tackle the challenge of laying out some basics for CRM users. Over the next few weeks/months I will try to post some (hopefully) useful articles that will help those end-users out there who are trying to wrap their heads around CRM. In my experience, end-users come with all different levels of technical knowledge. For instance, one sales organization I have worked with has some excellent salespeople who know very little about computer use beyond getting their email and surfing the internet. And, really, they shouldn't have to know more than that. CRM is not the core of what they do -- selling is. But, I guess because I work in the IT industry, I have become accustomed to the language of technology. I am amazed at how many times I've gotten basic questions from end-users that I wouldn't have addressed in training because, to me, they seem so obvious. For example, we told one client that we were setting up there CRM system to be accessed from the internet so they could use it from home or on the road. Now, within their network they just need to launch Internet Explorer and type 'crm' in the address bar and press Enter because we have set up their internal DNS to recognize this and direct them to their CRM server. I was surprised then when several of the end-users informed me that they had been trying to access the system from home and they kept getting "Page Could Not Be Found" errors. Of course, they were typing 'crm' in their browsers at home. They tried adding http:// in front of it, and they tried typing crm.com which didn't take them to what they were expecting! To me, this seemed too obvious to even mention. The problem, partially, was that they didn't read the email that was sent to them giving them the address to use to access CRM externally. They are busy salespeople after all, and they don't like reading emails from the IT people. Anyway, this is getting long-winded. You see the point: many, if not most, end-users need not only training in CRM and the basics of using a web application, but the application itself needs to be designed to work in ways they are familiar. That's part of the challenge with MS CRM. For many people it is the first web-based application that they have used, and it doesn't behave like client applications that they are accustomed to. (It doesn't show up on their Start menu, it gets blocked by pop-up blockers, data entered into forms doesn't get saved or recognized until they hit save to submit it back to the server, etc.) So, end-users, take heart, in the coming weeks I will be posting articles here about using CRM that should help you become the envy of your co-workers. This would be a good time to subscribe to my RSS feed -- oh, but here again, most non-technical end-users aren't familiar with this technology either! Consistency is the key here. Users want to do something the same way every time. For example, we set up all users to access crm at http://crm.domain.com no matter where they are at. It is confusing, though. The organisation I belong to have recently implemented CRM, in simple words its been a disaster. I have now been called into to try and fix up the problems, staff are not using CRM, they don’t trust it, training has been confusing and no one is really sure what CRM is used for. My organisation is involved in research and workforce development so the primary use of CRM for us is keeping track of our relationship within the sector we work in (which is health), staff total around 30 and growing. My only qualification for being involved in the fix up project is my familiarity with CRM and also communication skills. I have been reading a lot on the internet about the problems others have had with CRM implementation however there is not much around on how to fix these problems. Can anyone here offer advice?